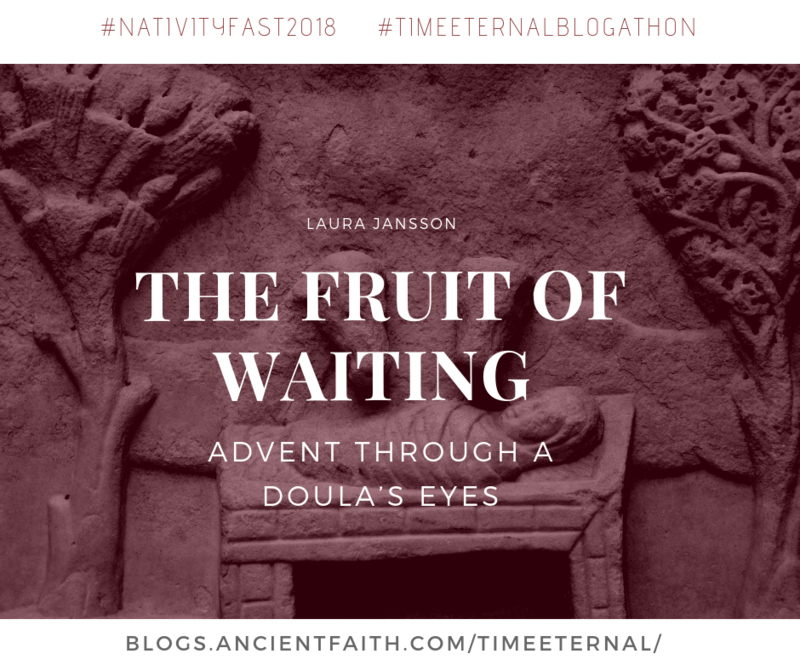 In this unique guest post, doula Laura Jansson reflects on the connections between Advent and the kind of waiting and her work helping mothers birth their infants into the world. What a timely perspective! Advent – a time of waiting. But if we’re honest, what are we waiting for? What are you most looking forward to about Christ’s Nativity? Maybe it’s giving and receiving presents, the warmth and work of family gatherings, breaking the fast with turkey, or time off work – all gifts from God and worthy of anticipation. We may also look forward to finding deeper spiritual treasures nestled among the cultural trappings: Nativity hymns speaking fearlessly of God With Us. Candles in the darkness, glinting off gold, showing that hope has dawned. The icon showing Christ in his sarcophagus-like crib, ready to accompany humanity through its greatest struggles into heavenly radiance. But there is also something more fundamental, something both simpler and more profound, that we await. We’re waiting for a baby: a wrinkled, snuffly, purplish newborn child. With the Theotokos, we’re marking the days of pregnancy, watching for labor to begin. We’re expecting to hear a sputtering first cry, to see a first gulp of air. We’re anticipating the moment when a new mother flops back into the straw, clutching her slippery baby, a strand of hair plastered across her damp brow. She will toss her head back with a look of relief: we did it. We’ve passed through this vale, though danger compassed us on every side. Here He is at last. Of course, we are not only expecting a baby. We are expecting the Eternal God, Emmanuel come mightily to save. But that’s the mystery of the Incarnation: God becomes flesh of our flesh, bone of our bone. Being one of our kind, He makes us one of His kind. Though it’s a God-baby we’re expecting, it’s a baby nonetheless. The Theotokos, like any pregnant woman, must wait through physical discomforts: a belly so big she cannot untie her sandals, sleep interrupted by kicks in the ribs, a pelvis aching as her ligaments soften in preparation for childbirth. She is stretched thin in every sense. But the spiritual discomforts are greater. Though she may be eager for relief from her burden, the prospect is also fearsome. She does not know how it will feel to give birth, or whether she and her baby will survive. Neither does she know the date labor will start – in fact, without the technology of our own age, she may not even know the month. She must carry on attending to the duties of everyday life, even undertaking a 90-mile journey to take part in the census, yet she must also be ready to drop everything when the time comes. The moment her child is born, her life will be remade. She will leave her girlhood behind and become the one whose heart a sword will pierce. As a mother of four whose buns tend to need a little longer in the oven, I’ve become reeeally good at waiting for babies. I’ve spent a total of about three and a half years pregnant, including a month and a half “postdates”. With that much experience under my (much-loosened) belt I figured I might as well make a profession of it, so I became a doula, a professional childbirth companion. Now it’s actually my job to wait for babies. Each birth I attend may last a few hours or a few days, but each client I serve occupies a four-week on-call period in my planner, two weeks before her due date and two weeks after. Her appointed time lolls expansively across my other dates – birthday parties, teaching engagements, holidays and children’s performances – ready to gobble them up at a moment’s notice. When I have more than one client a month, these on-call periods overlap each other, layering my existence with uncertainty. Sometimes clients due at opposite ends of the month give birth within hours of each other. Occasionally they switch places. I have to be prepared for anything. As a doula, I live perpetually in the twilight zone of Advent. I must always be prepared to drop whatever I am doing. I have action plans for transport and childcare arrangements should I be summoned. I keep my bags packed, my sandwiches in the freezer. In the words of the Song of Songs (5:2), I sleep but my heart is awake, ready for a call. My life becomes a contingency for whole seasons, even years, at a time. Though this way of living isn’t easy, it has its rewards. I am a slow learner, but over the years I’ve been taught to predicate my arrangements on the providence of God. I postscript every plan with the words, “…if I’m not at a birth” (doula language for “if God wills”). Even when I’m not on call, I’ve come to consider all my appointments subject to change, upgrading or flat-out nixing when the Lord has something better in mind for me and the world. Little by little, birth by birth, I’m learning to be more open to His mercy. This is the kind of fruitful waiting we practice as we count down with the Mother of God to the Nativity of her son. Like doulas on call for the birth of the Lord, our job is to wait and let the waiting change us. We live not just in the present tense but in thirsty anticipation of things to come. However our waiting is not just ‘dead time’. It teaches us to adapt, grow, watch and make ready. It softens our hearts in reliance on God so that when He comes not only in a manger but in Glory, we will be prepared to receive Him. 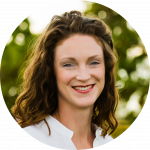 Laura Jansson is an experienced birth worker and Orthodox Christian with an Oxford theological degree. 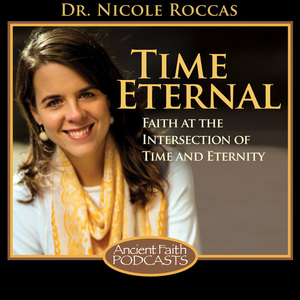 She is also author of the forthcoming book under the working title Fertile Ground: A Pilgrimage Through Pregnancy (under contract with Ancient Faith Publishing). You can find more of her work at laurajansson.com.